A photo from the Diaconate Ordinations yesterday, January 11th, in Mbulu. Rev. Stephen Lwebuga S.A.C is on the extreme right of the photo and next to him is Rev. Norbert Mukabwa S.A.C. 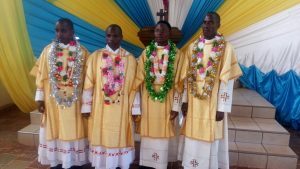 We congratulate the four new deacons, two for the local Dioceses and our Pallottine confreres and we wish them every blessing in their new ministry.